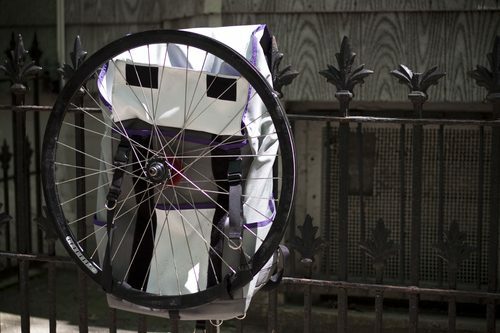 A few weeks ago, Nathan Larsen from Velo City Bags sent me a little surprise. He offered me a backpack to test out and I gladly accepted. At the time, I requested the simplest colorway, all black. 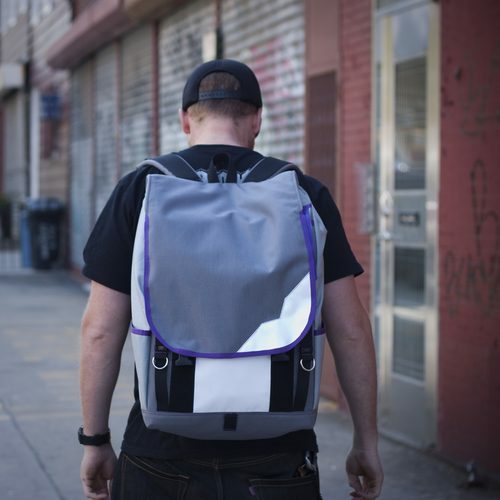 A few days later, a box arrived and inside was a backpack matching my blog template. Pretty funny. I’ve been using the bag as an everyday staple since and figured it was time for a review. Check out more photos and the continued review below. 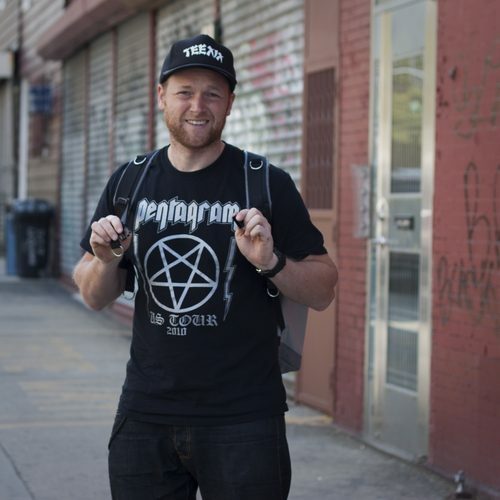 Nathan hand-makes each of his bags in Salt Lake City. There’s a lot to be said about the craft of the bags. They’re super durable, well-padded and comfortable. Here’s the medium model, loaded with the daily cargo; a tool pouch, DSLR bag, rain jacket and tubes. Along with a chest strap, there’s also a waist strap for carrying bigger loads. The d-rings make it easy to adjust and they help make it easy to tuck the excess straps away. I am actually really glad the interior of the bag is white. When bags have a dark interior, sometimes it makes it difficult to see what’s inside. 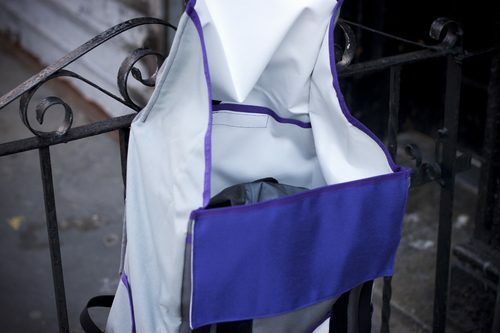 Even though it will dirty quickly, the durable and waterproof lining will clean up easily. 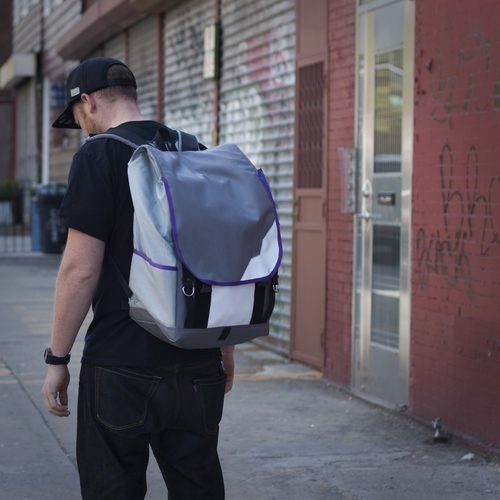 There are two-velcro enclosures inside the bag’s body and another d-ring for your keys. 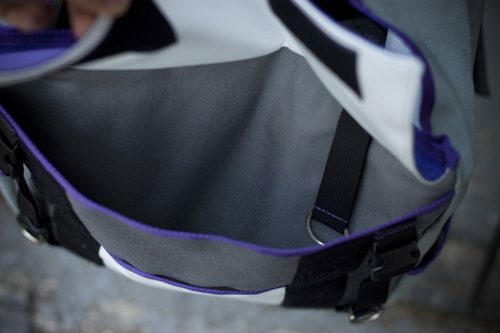 Under the main flap is an open pocket for quick-to access items like pens, pads, etc. 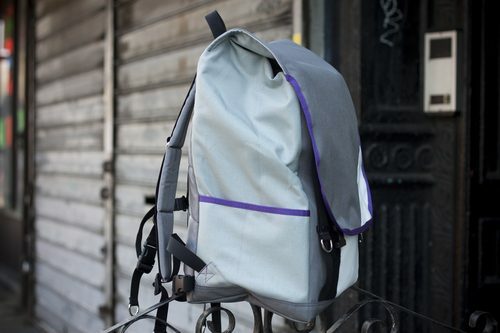 Having a separate pocket for tools is always convenient and the Velo City backpack has that as well. This pocket is an optional add-on. There’s more on that below. The medium fits me quite well. It’s not too big or too small. One nice detail are the open side pockets. Perfect for water bottles, tall boys, ulocks and other on-the-go items. This size is perfect for an every-day bag. It’ll fit everything you need without being too big and bulky. You should note the two extra buckles peeking out from the main flap. Those are cargo extensions. More on those below. The optional chest straps are a nice touch. When you’re not towing around large items, the large flap retains closure by velcro strips but when you need to load something on your back, cargo straps can be used in two ways. Either like so by simple giving the straps some slack and letting the flap fold over (this would work well for rolled drawings or flat objects. Or by using those extra buckles I mentioned earlier. This is my preferred method for wheels. Since Nathan makes these bags at home, he went with industry-standard buckles. That way if you snap one by accident, it should be very easy to get it repaired. 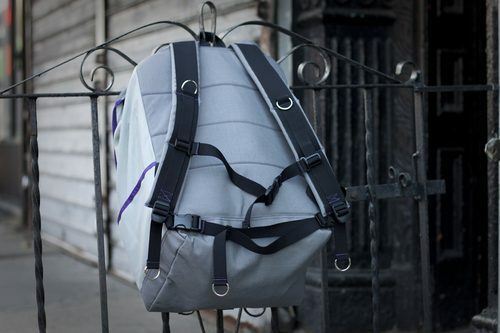 Overall, the Velo City backpack’s a great addition to anyone’s bag collection. It’s not too big and not too small. 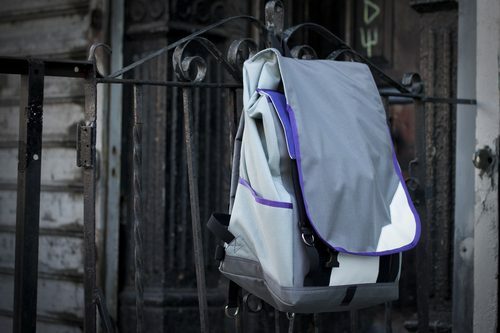 The bag is 100% waterproof and is detailed nicely. Not to mention they’re all custom built so colors, additional pockets and accessories are all super easy to add to the bag. 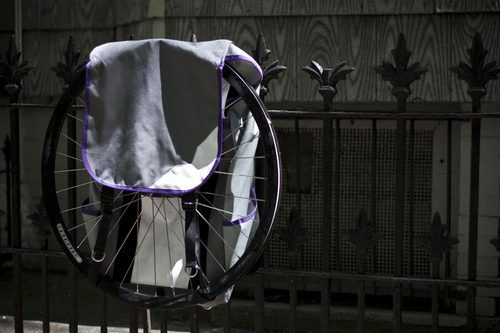 If you like what you see here, head on over to Velo City Bags to check out their other offerings!